The Rules are typically updated every four years through the work of the R&A and the United States Golf Association. A joint committee of these associations, on which the Chair of Golf Canada’s Rules and Amateur Status Committee sits, is charged with revising, modernizing and improving the Rules of Golf. These two documents form the complete Rules of Golf that are used universally throughout the world of golf. For clubs or committees in charge of competitions, the Conditions of Competition and Standard Local Rules that Golf Canada implements at all championships is posted for your reference. In addition, a list of local rules that should be considered is available on this website. As the National Sport Federation and governing body of golf in Canada, Golf Canada, in conjunction with the R&A and the USGA, have unveiled the 2019 Rules of Golf. This joint initiative was designed to modernize the Rules and make them easier to understand and apply. ‘Player’s Edition of the Rules of Golf’: An abridged, user-friendly set of the Rules with shorter sentences, commonly used phrases, and diagrams. Written in the “second person,” The Player’s Edition is intended to be the primary publication for golfers. Click here to view the 2019 Player’s Edition. ‘Full Rules of Golf’: The full edition of the Rules will be written in the third person and will include illustrations. The Rules of Golf is intended to be the primary publication for officials and is expected Golf Club Committees and Referees will use the publication as their primary Rules of Golf resource. Click here to view the 2019 Rules of Golf. 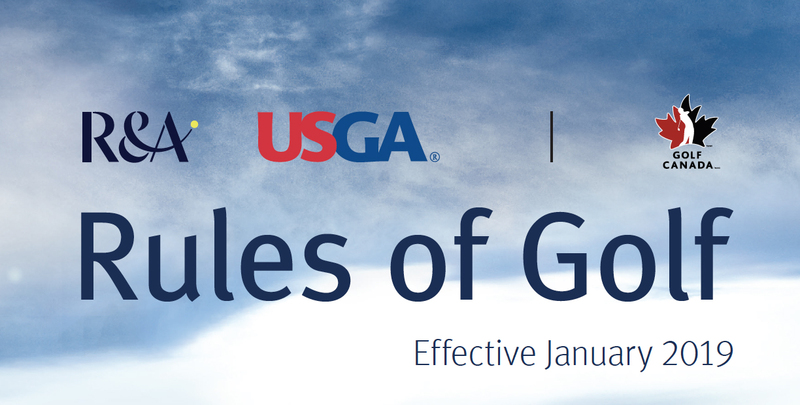 The Official Guide to the Rules of Golf: This “guidebook” replaces the Decisions book and will contain information to best support committees and officials. It includes interpretations on the Rules, Committee procedures (available local rules and information on establishing the terms of the competition), and the Modified Rules of Golf for Players with Disabilities. It is a “long-form” resource document intended as a supplementary publication. Click here to view the 2019 Official Guide. The top 10 Rules Essentials will allow every golfer to learn the essentials of the new Rules of Golf in a fun and user-friendly way before playing in 2019. There will be 10 short videos to explain the most commonly used Rules. Click here to view. The Committee Toolkit has been designed to help those responsible for preparing the golf course for general play and for those running and administering competitions at all levels. The “Toolkit” aims to help Committees get to know the Committee Procedures section of the Official Guide, and to better understand the changes that they need to make in advance of 2019 to reflect the new Rules. The toolkit also includes a ‘Local Rules Creator’. The purpose of this is to helps Clubs and Committees with the process of updating Local Rules for 2019. Of course, the amount of space available on scorecards is limited and with that in mind, short form Local Rules are also available. Click here to view. The Rules Academy will be updated for the 2019 Rules of Golf. The “Academy” is aimed at all golfers and will use a combination of text, videos and diagrams to help you learn the most important aspects of the Rules. You will also have the option to take an exam at the end to check that you are 2019-ready. The Rules Academy is the on-line version of a Level 1 R&A Rules Seminar, which is the first step of the R&A’s three tier Rules Education programme. In addition to publishing the Rules of Golf, Golf Canada is committed to train and educate all golfers that could ultimately lead to national certification as a Referee. New for 2019, Golf Canada will be adopting the R&A’s Rules Education system. 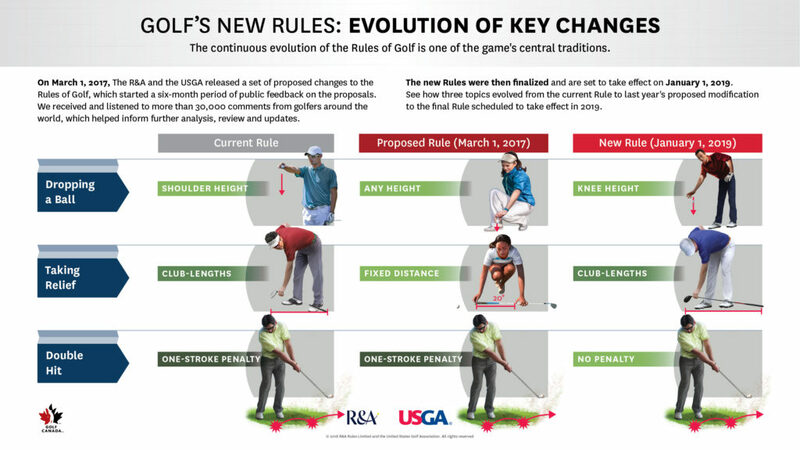 One of the main objectives of the Rules Modernization Initiative was to create consistency around the world in many facets of the Rules of Golf, including educating and training referees. The exams that Golf Canada will use and the designation by marks achieved will be consistent throughout the countries allied to the R&A, such as Argentina, Australia, New Zealand and South Africa. While Golf Canada traditionally has employed a four-level system, the R&A’s Rules Education program consists of a three-tiered approach. In order to align the programs, Golf Canada’s current Levels 1 and 2 will be consolidated into just one level (the new Level 1). We will maintain separate programs for individuals to continue through our Rules Education Pathway at the provincial and national level, which will be the new Level 2 and Level 3. Level 1 provides an interesting and easy way to learn the basics of the Rules of Golf. This level will focus on Etiquette, the principle definitions and commonly encountered situations on the course. As part of the Level 1 program, students will be able to test their knowledge by taking the review questions at the end of each section before attempting the online Level 1 Exam. Level 2 (provincial certification) seminars will be conducted by provincial golf associations (PA), and the curriculum will begin to look at the more important playing Rules in detail. Some of the complexities that are found in the Rules of Golf book or the Official Guide on the Rules of Golf are introduced along while also implementing on-course demonstrations. Level 2 (Provincial) will be designed for individuals with an involvement in tournament administration, or a desire to have such an involvement. Attend and achieve a minimum of 80% on the Level 2 exam, administered by the PA. Complete 50 hours of on-course experience as a Referee. For Level 3 accompanying opportunities in your area, please see the Golf Canada Competitions schedule or contact your Provincial Association for more information. Level 3 (national certification) will consist of a three-day seminar run by Golf Canada. It serves to give guidance and advice on refereeing at the highest level. This program is intended for experienced referees who wish to improve both their technical and practical knowledge as a referee. Attend and achieve a minimum of 80% on the Level 3 exam, administered by Golf Canada. Complete 100 hours of on-course experience as a Referee, including 10 of those hours accompanying a current Level 3 certified Referee. Golf Canada’s seminars on the 2019 Rules of Golf are intended for experienced referees. The spring 2019 seminars will be focused mainly on the changes to the Rules for 2019 with less time spent on officiating. NOTE: For this seminar series, there will not be an option to write the exam without attending the seminar. The List of conforming drivers and conforming golf balls are universal lists used by all golf associations. To ask a rules question, please email us at smrules@golfcanada.ca. If you have a rules question regarding a competition currently taking place (the competition has not closed), then you may wish to use the Competition Hotline. To contact Golf Canada for a ruling during a competition please call Adam Helmer, Director of Rules and Competitions at 416-450-6374. If your call is not answered immediately, please leave a detailed message including your name, title (Rules Chair, Professional, etc.) phone number where you can be contacted and a description of the incident requiring a ruling. Your call will be returned as soon as possible.